This post is sponsored by Budweiser Barbecue Sauce. All opinions are my own. 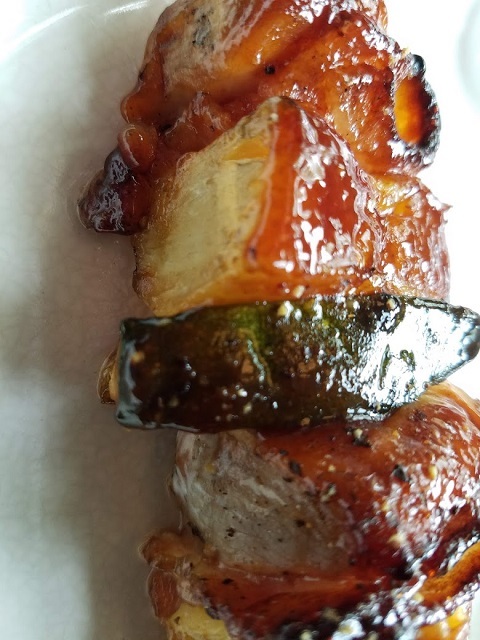 These Best Chicken Shish Kabobs are smoky and sweet. 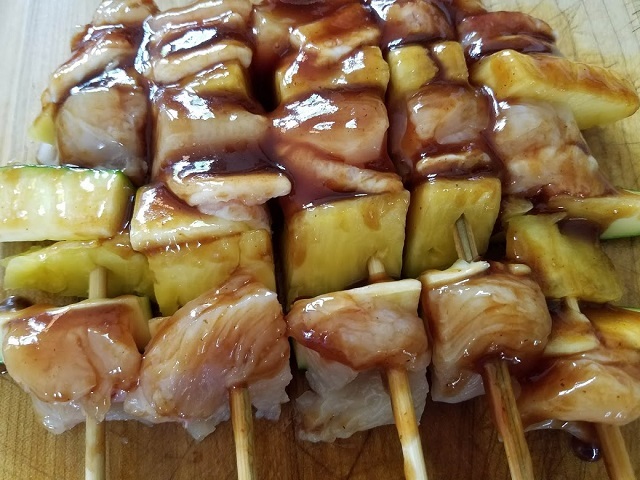 Each skewer is filled with juicy pineapple, tender chicken, crispy bacon and savory zucchini slathered in Budweiser Sweet and Savory Barbecue Sauce. 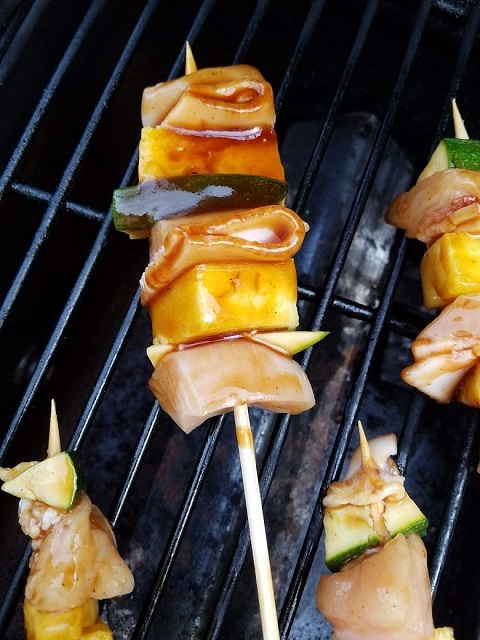 Memorial Day is right around the corner and you will want to impress your guests with these mouthwatering Chicken Shish Kabobs! They are easy to make and don’t take much time to cook on the grill. This Chicken Shish Kabob is so delicious, tender, and juicy. 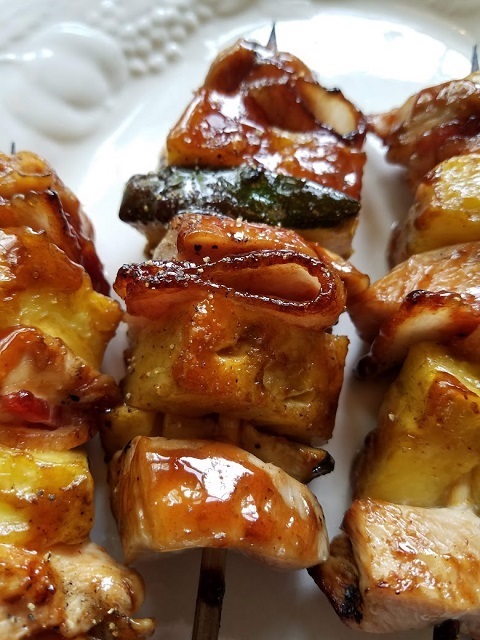 The chicken, pineapple, bacon, and zucchini will melt in your mouth. If you have been following my blog, you will know that we are year-round grillers, yes, even in Maine! My husband loves to grill even when it’s snowing, he just brings his glass of wine outside and watches it get chilled quickly! So you can only imagine how much grilling gets done during the warmer weather months! Hooray for the grill! These yummy kabobs were devoured in no time flat. It’s funny – if I put these same ingredients on a plate my kids would have enjoyed them with little fanfare. But put it all on a stick- they take notice & really LOVE their dinner. Kids and kabobs are a win-win! 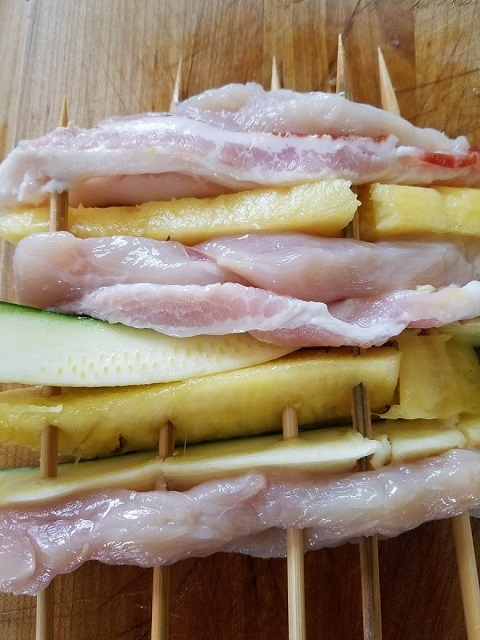 While everyone is cooking the usual burgers and hot dogs for Memorial Day, these Chicken Shish Kabobs will be the star at your Cookout! Kick-off the summer with these perfect Kabobs for your Memorial Day 3-day holiday! 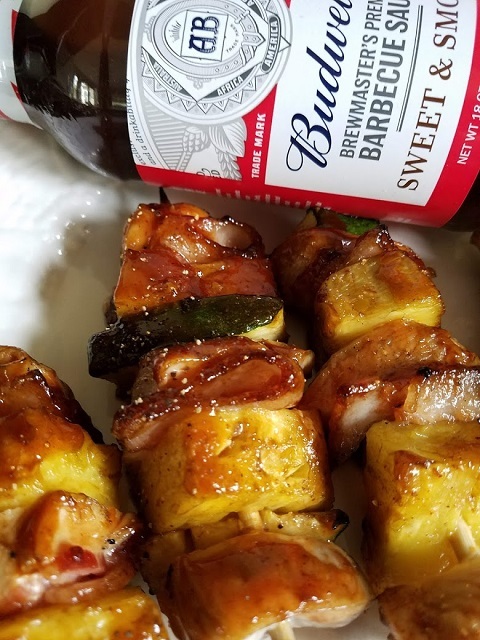 Make your chicken Shish Kabobs over the top with flavor with the Budweiser SWEET & SMOKY BBQ SAUCE. This sweet and smoky sauce is straight from the smokehouse. Made with Budweiser beer and the perfect blend of spices, this bold sauce is a true original. 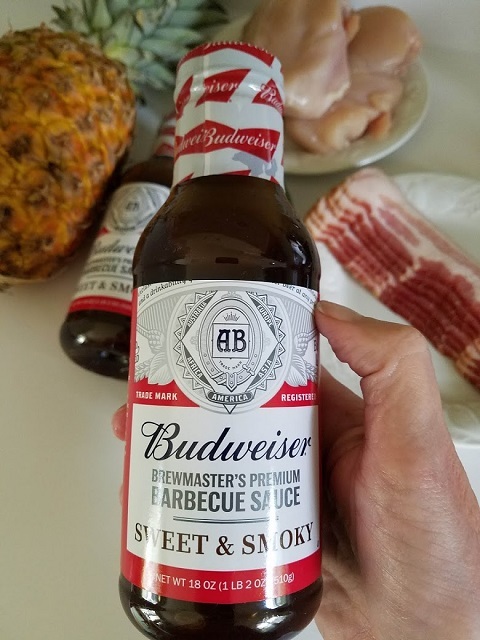 Now that it’s almost summer, Budweiser Sauces are a great compliment to any grill or cookout. TASTE THE BUDWEISER DIFFERENCE! Like the famous Budweiser beer, this genuine line of sauces contains only the finest ingredients for a truly exceptional taste experience. 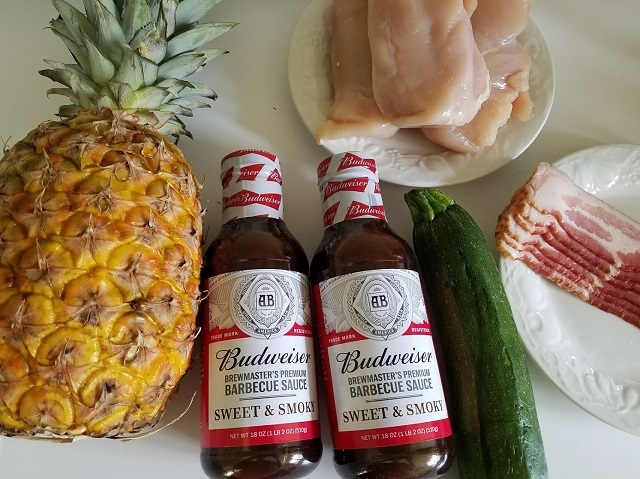 Budweiser Executive Chefs, in conjunction with the Brewmasters of Anheuser-Busch, have perfected the sauce recipes, assuring that the cooking experience is the best it can be. Taste the difference that only a premium sauce with the Budweiser name can deliver. Heat an outdoor grill or grill pan to 350°F. Set aside a large baking sheet, 10 skewers, and a basting brush. Peel Pineapple and cut pineapple into six wedges. Place a chicken breast on a work surface. 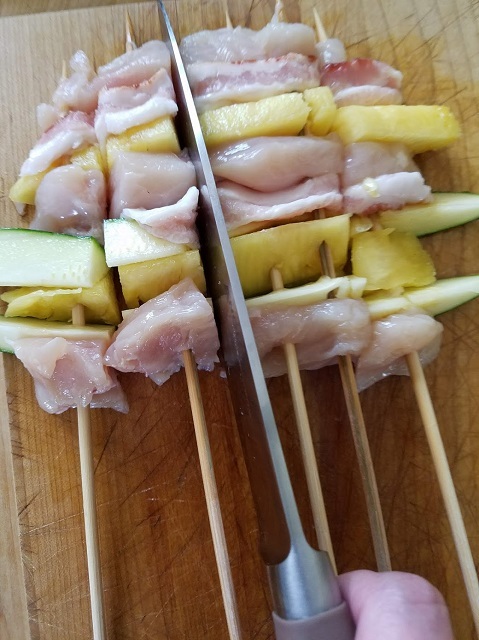 Place a pineapple wedge next to the chicken, followed by a zucchini wedge and a doubled up slice of bacon. 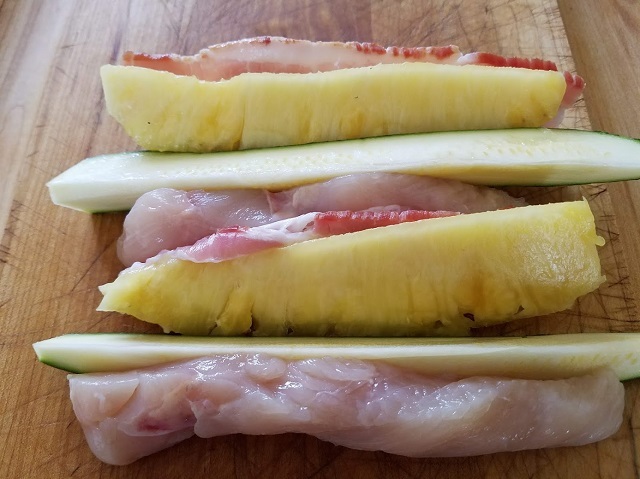 Cut the chicken breast in half, and place the second half next to the bacon, followed by more pineapple and zucchini. Insert a skewer to penetrate each layer about an inch from the edge. Insert 4 more skewers about 1 1/2″ apart until you can lift everything easily by the skewers. Cut through with a sharp knife, to make a shish kabob. 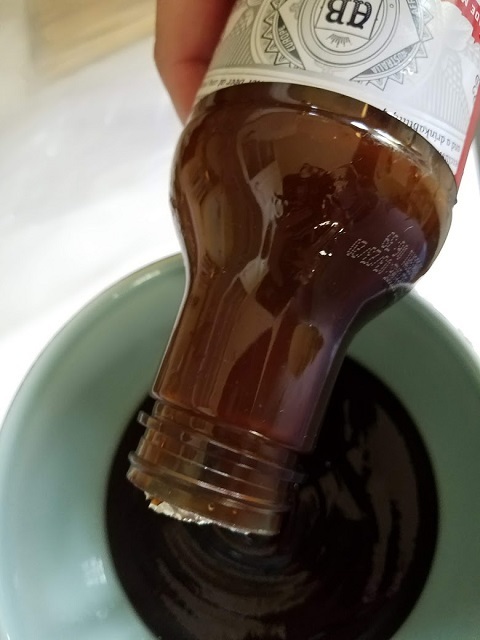 Put about half the sauce into a small bowl for later. Brush thoroughly with Budweiser Sweet and Smoky BBQ sauce. Flip the skewers and brush the other side. Place on the prepared baking sheet to transfer to the grill. Repeat the previous steps to make a second batch of kabobs. Spray the BBQ grill grates thoroughly with cooking oil spray. 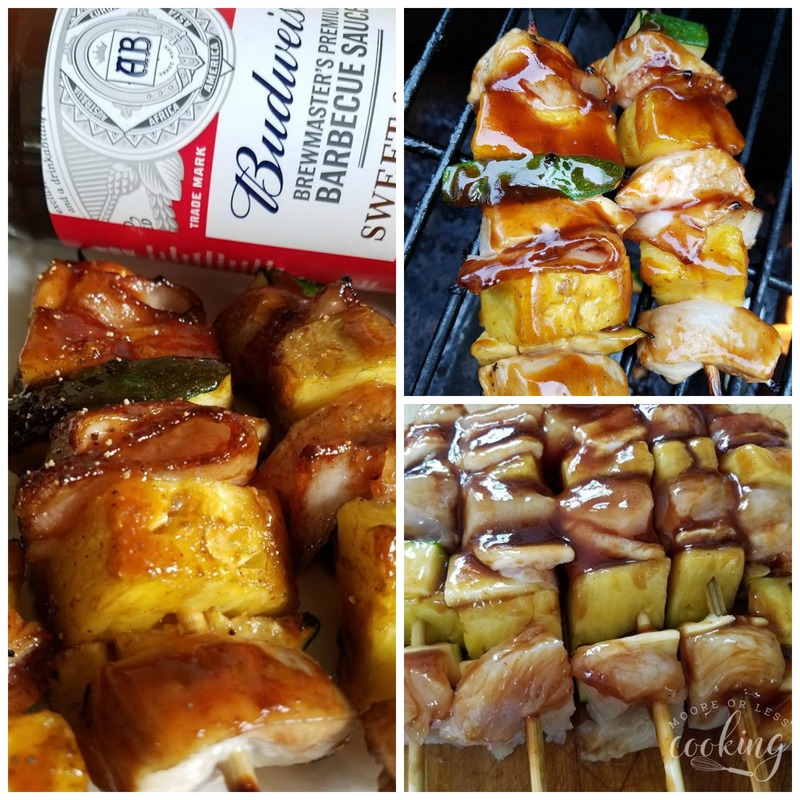 Place kabobs on the grill and cook for 10 minutes, flipping them halfway through and brushing a second time with the Budweiser Sweet and Smoky BBQ sauce until cooked through about 10 to 15 minutes. Serve with reserved barbecue sauce on the side for dipping. Insert a skewer to penetrate each layer about an inch from the edge. Insert 4 more skewers about 1″ apart until you can lift everything easily by the skewers. Cut through with a sharp knife, to make a shish kabob. 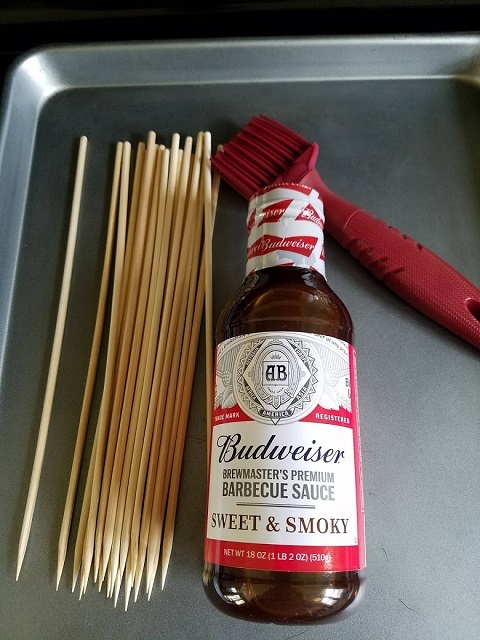 Brush Budweiser Barbeque Sauce over the kabob. Flip kabob over and do the same on the other side. Place Kabobs on a baking sheet. 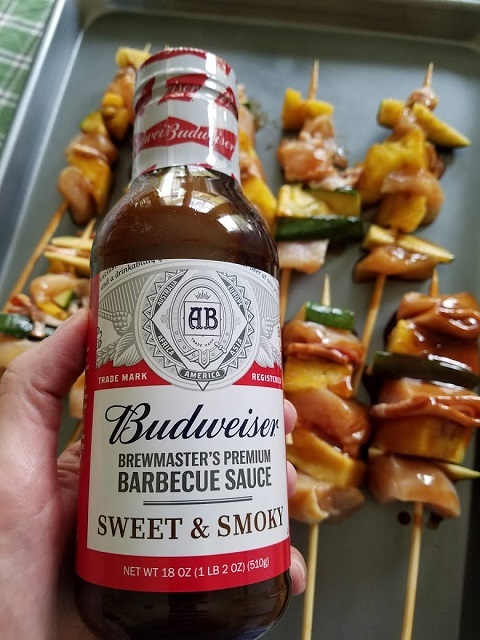 Grill Kabobs for 10 minutes, flip and cook another 10 minutes until cooked through, brush with more Budweiser Sweet and Savory Barbecue Sauce. If you try Budweiser BBQ sauces, please let me know, make sure to tag me at #mooreorlesscooking.com. Peel Pineapple, core it and cut pineapple into spears. Insert 4 more skewers about 1 1/2" apart until you can lift everything easily by the skewers. Cut through with a sharp knife, to make a shish kabob.